You are currently browsing the tag archive for the ‘cookery’ tag. There is a classic Nigella moment when she says “I like a bit of brutality in the kitchen” with that gleam in her eye and she leans onto a raw, whole chicken to flatten it slightly to make it easier to cook. Food is about legacy and passing recipes on, and along with this, recipes, traits or style are passed on. She amuses everyone with a story of a woman who made a pot roast and to start she would cut off both ends of the pot roast. When asked why she did this she answered that it was what her own mother had always done so she did it. When they asked her mother why she had done it she said that that was her mother had done. When they asked the grandmother why she had done it she said that the reason why she did it was because her pot was too small to fit the pot roast! She is the best known female food personality in the world today. The mere mention of her name can cause people to recall, accurately, what she sounds like, how she smiles, and, of course, how she cooks. You might think it could be unnerving being Queen of Gastroporn Nigella Lawson and constantly having your sensual charms – and curves – discussed alongside your body of work. But Lawson says that she can’t control how people perceive her and that ”it’s wrong to get into a state about it”. Lawson is in Australia for the Melbourne Food and Wine Festival, of which she is the star attraction. After graduating from Oxford University, Lawson worked as a literary journalist and opinion page columnist before releasing her first cookbook, How to Eat, which became a bestseller. Her first television series, Nigella Bites, became an incredible success and soon she was known as a woman who loves food and doesn’t torment herself dieting. ”I am always thinking about what my eating opportunities are, and what I can manage to get in,” she says. Peel and roughly chop the onion and stick the pieces in the processor with the bacon and parsley. Or chop finely by hand. Melt the 75g butter in a largish, heavy-based pan and, keeping the heat fairly low, cook the processed mixture until it softens, about 10 minutes. Remove to a bowl and, using your hands, crumble in the chestnuts so that they are broken up slightly, then mix in the breadcrumbs and chestnut purée. This isn’t very hard to do by hand (a wooden spoon and brutal manner will help), but an electric freestanding mixer with the paddle attachment is the agreeably lazy option. If you are making this in advance, then let it get cold now, otherwise beat in the eggs, season with only a little salt (remember the bacon will contain some) and a good grating of fresh nutmeg and fresh pepper. 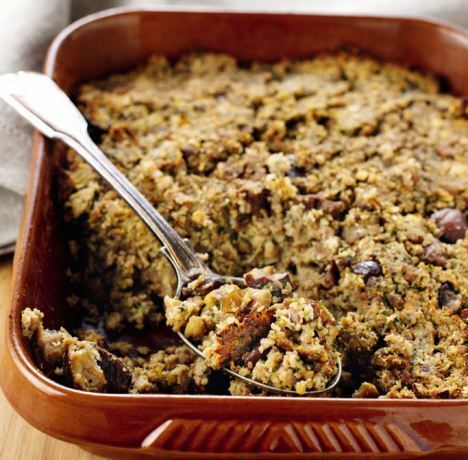 If you want to stuff the turkey with this on Christmas morning, be my guest; otherwise butter your dish or foil container, add the stuffing, spread the 15g butter on top, and bake, uncovered, in the oven underneath the turkey for 30-40 minutes, depending on how full your oven is. Although I stipulate a capacious 1.7 litre basin, and cannot extol the utter gloriousness of this pud too much, I know that you’re unlikely to get through most of it, even half of it, at one sitting. But I like the grand, pride-instilling size of this, plus it’s wonderful on following days, microwaved in portions after or between meals, fried in butter and eaten with vanilla ice cream for completely off-the-chart, midnight-munchy feasts. But it wouldn’t be out of the question – and it would certainly be in the spirit of the season – to make up the entire quantity of mixture, and share between smaller basins – a 2 pint one for you, a 1 pint one to give away. Three hours’ steaming both first and second time around should do it; just keep the one pudding for yourself, and give the other to a friend, after it’s had its first steaming, and is cool, with the steaming instructions for Christmas Day. Put the currants, sultanas and scissored prunes in a bowl with the Pedro Ximénez, swill the bowl a bit, then cover with clingfilm and leave to steep overnight or for up to 1 week. When the fruits have had their steeping time, put a large pan of water on to boil, or heat some water in a conventional steamer, and butter your heatproof plastic pudding basin (or basins), remembering to grease the lid, too. In a large mixing bowl, combine all the remaining pudding ingredients, either in the traditional manner or just any old how; your chosen method of stirring, and who does it, probably won’t affect the outcome of your wishes or your Christmas. Add the steeped fruits, scraping in every last drop of liquor with a rubber spatula, and mix to combine thoroughly. Scrape and press the mixture into the prepared pudding basin, squish it down and put on the lid. Then wrap with a layer of foil (probably not necessary, but I do it as I once had a lid-popping and water-entering experience when steaming a pudding) so that the basin is watertight, then either put the basin in the pan of boiling water (to come halfway up the basin) or in the top of a lidded steamer (this size of basin happens to fit perfectly in the top of my double-decker couscous pot) and steam for 5 hours, checking every now and again that the water hasn’t bubbled away. When it’s had its 5 hours, remove gingerly (you don’t want to burn yourself) and, when manageable, unwrap the foil, and put the pudding in its basin somewhere out of the way in the kitchen or, if you’re lucky enough, a larder, until Christmas Day. On the big day, rewrap the pudding (still in its basin) in foil and steam again, this time for 3 hours. Eight hours’ combined cooking time might seem a faff, but it’s not as if you need to do anything to it in that time. 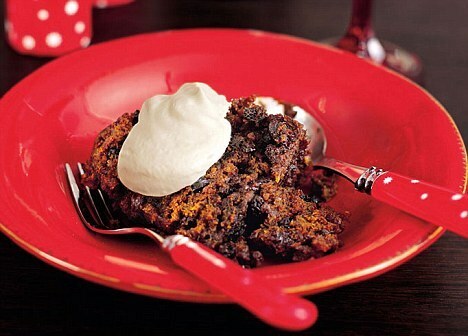 Put the sprig of holly on top of the dark, mutely gleaming pudding, then heat the vodka in a small pan (I use my diddy copper butter-melting pan) and the minute it’s hot, but before it boils – you don’t want the alcohol to burn off before you attempt to flambé it – turn off the heat, strike a match, stand back and light the pan of vodka, then pour the flaming vodka over the pudding and take it as fast as you safely can to your guests. If it feels less dangerous to you (I am a liability and you might well be wiser not to follow my devil-may-care instructions), pour the hot vodka over the pudding and then light the pudding. In either case, don’t worry if the holly catches alight; I have never known it to be anything but singed. This involves a simple, but amply satisfying procedure. In advance, as soon as you get your bird home, remove any trussing, take out the giblets and stash them separately in the fridge. Before putting the turkey in the fridge, wash the inside of the bird with cold running water. Drain well and blot dry with kitchen towels. The important thing is that you take your bird out of the fridge a good hour before you want to start cooking it, so that it’s at room temperature before you begin. Preheat the oven to 200°C. Now comes the bosomy bit. You take your turkey and, using your fingers, wiggle some space between the skin and breast of the bird, being careful not to tear the skin. (Mind you, turkey skin is so tough, you’d probably need talons to rupture it.) Into this space you’ve made, squeeze good sausage meat, or the contents of your favourite butcher’s sausages (900g of either should be enough for a 5.5kg turkey), pushing, pressing and coaxing so that it covers the whole breast. Then, from on top of the skin, mould it a little with your hand so that the breast is voluptuously but smoothly bulging. Secure the flaps of skin over the cavity with a metal skewer so that the sausage meat doesn’t escape during cooking. 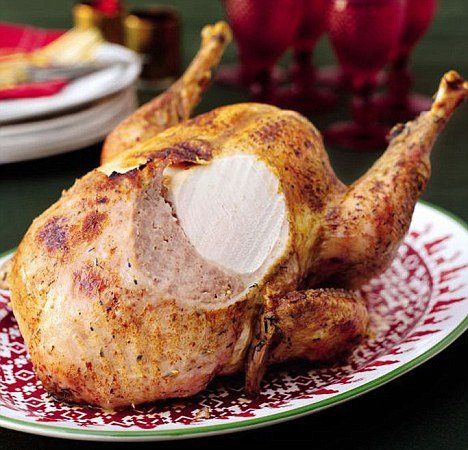 The skin really crisps up as this turkey roasts, and the sausage meat, which drips down into the breast as it cooks, keeps the meat from drying out. To ensure the turkey doesn’t brown too rapidly, cover it loosely with a sheet of buttered foil until halfway through the cooking time about 2 hours 40 minutes total for a 5.5kg bird with its sausagey faux-bosom). You could then dispense with the chipolatas (or stuffing if you can live without it), so this is a good way of cutting down on dishes to prepare, without making huge sacrifices. This is perhaps one of the most useful puddings you can have in your repertoire. Not that it is the job of a pudding to be useful: a pudding exists merely to delight. Still, dinner does need to be made, even when there’s precious little time for it and that should be a delight, too. So here’s the deal: there is pitifully little work to be done to make this berry-dazzler of a tart, and enormous pleasure to be derived from its consumption. All you do is bash a few biscuits a day or so in advance and make the base – getting one course out of the way early is my way of managing – then stir lemon curd and cream cheese together, and use this cream to line the crumb-covered tart tin. I use shop-bought lemon curd here, but even if it comes out of the jar, it must be of good quality. And when it is whipped into the cream cheese, that cream cheese must be at room temperature, as should the lemon curd in its jar. The combination produces a layer of what tastes like cheesecake cream: light, lemony, luscious. I used to put the berries on top of the cream pretty much last-minute, but then I found that a leftover wedge, after the party, looked inviting after being in the fridge overnight, and so I now finish assembling the tart ahead of time. But if you prefer to add the fruit nearer to serving, I completely understand. 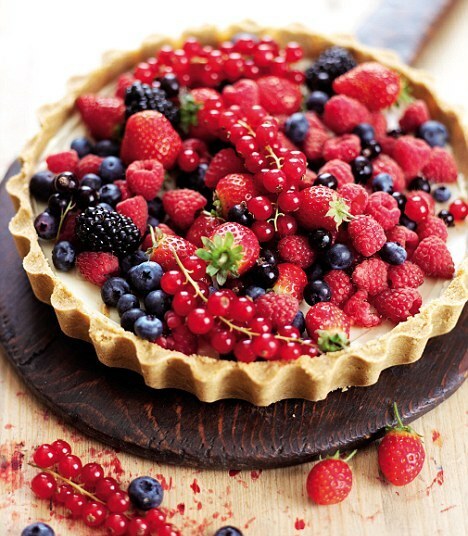 Don’t feel you must obey the fruit orders too literally: any mixture of berries (or indeed other fruit) would do, and you could well use a smaller amount and top the tart less extravagantly. Process the biscuits and the butter to a sandy rubble and press into the sides and bottom of a deep-sided fluted tart tin. Place in the freezer (or fridge if that is not possible) for 10-15 minutes. In a clean processor bowl, process the cream cheese and lemon curd (or just mix by hand) and spread into the bottom of the chilled tart tin, covering the base evenly. Arrange the fruit gently (so it doesn’t sink in too much) on top of the lemony cream cheese in a decorative manner (see right), leaving some of the strawberries unhulled, with their picturesque stalks attached. Place the tart in the fridge, preferably overnight, though for at least 4 hours. It does need to get properly cold in order to set enough for the tart to be unsprung and sliced easily. 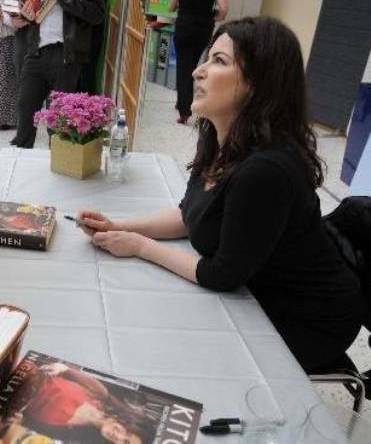 Kitchen Goddess Nigella Lawson visited Leeds to sign copies of her latest cookery book. The smouldering TV star of effortless cooking – who has written for a number of newspapers and magazines, and has launched a successful cookware range – was at Asda House. Supermarket staff were invited to meet Nigella and buy a signed copy of Kitchen: Recipes From the Heart of the Home, with 50p from every sale donated to the Tickled Pink Campaign for Breast Cancer Care. There are a few meals I can say I’m making that will make my children excited (or pretend to be), and this is one of them. Alongside there must be ‘pie insides’ (which is what my daughter has always called leeks in white sauce) and for ultimate gratification, roast potatoes. Although I usually use goose fat for roast potatoes, I feel the pork belly allows, indeed encourages, the substitution of lard. I’m not convinced that with all that fabulous crackling you do need roasties as well, but I like to provide what makes people happy. I actually prefer noodles or a bowl of plain, steamed brown basmati rice, and urge you to consider either; and I love to sprinkle a little rice vinegar on my own plate of pork as I eat. This is another of those recipes that you can get done in advance and then have the afternoon off, unworried. I have advised an overnight marinade, but if I’m making this (as I tend to) for Sunday supper, I often prepare it in the morning and leave it in the fridge loosely covered with baking parchment, or midday-ish and leave it uncovered in a cold place (but not the fridge) for a few hours. Get out a shallow dish in which the scored pork will fit snugly and in it whisk together the tahini, soy sauce, lemon and lime juice. 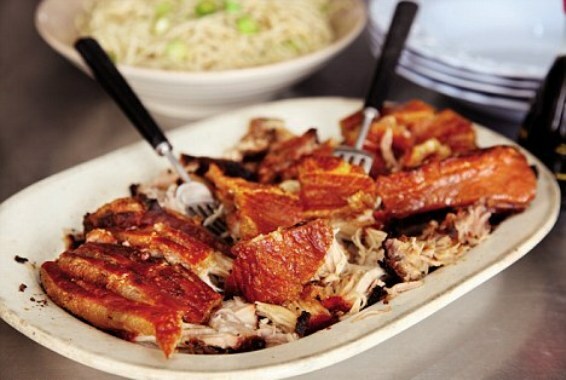 Sit the pork on top, skin-side up. You should find the marinade covers the underside and most of the sides, but doesn’t touch the rind: that’s what you want. Leave the pork in the fridge to marinate overnight, covered with foil, and then take out to return to room temperature before it goes into the oven. Preheat the oven to 150°C. Get out a shallow roasting tin and line with foil. Transfer the pork to the roasting tin and cook it uncovered for 3½ hours, then turn the oven up to 250°C and cook for a further ½ hour to let the skin crisp to crunchy burnished perfection.